This post documents the main areas of success and failure in the event. Firstly I wish to thank everyone who participated in Audiogame Jam. Without their hard work and enthusiasm the jam would not have been nearly as successful as it was. Please visit the Audiogame Jam website, try the games and give the developers feedback. You can also support Audiogame Jam by donating to RNIB through the Audiogame Jam JustGiving page. Using existing game jam tools on GameJolt made it easy to get started with a presence online that I could easily build on. This made managing the event a lot easier than it would have been if I’d tried to do it on my own. Using Twitter as a tool to raise awareness of event. It led to a lot interest, positive feedback and advice from those with more experience. Circulating the event among RNIB staff. The idea was popular within RNIB and I received a lot of support from them in promoting the jam through RNIB Connect Radio and other third sector organisations. Engaging with the community participating in Audiogame Jam helps keep everyone’s enthusiasm for the event high. It’s also it’s own form of promotion, raising forum threads and bringing information about the jam to anyone following related topics or tags on social media. Creating images and posters to spread online. Promotional material to advertise the event and mark important milestones seemed to work well in drawing in people throughout the jam. Working with RNIB to have some of the Audiogame Jam games playable at their Techshare Europe 2016 event. Not deciding the date of jam properly before advertising it on game jam websites and forums. This led to having to edit posts and pester website administrators to correct my mistakes. Not checking for other game jams running concurrent to Audiogame Jam’s planned start and end times. I should have arranged it for another time to avoid having a negative effect on Audiogame Jam or other local game jams, especially other with causes I support. The focus of the jam was audio-based gameplay rather than specifically creating blind-accessible games. In any further Audiogame Jams the focus will be on blind-accessible games as it’s a better fit with the RNIB fund-raising goal of the jam. Announcing the jam four weeks before it began may have been a mistake. The relatively short time until it began may have made planning for participants difficult and led to few submitted games. Failure to use current RNIB branding on some promotional material I produced led to them having to be reworked and reposted again later. The old posters with the incorrect branding were still being used by others for some time after the new posters were published. This didn’t cause any friction with RNIB but it’s a mistake I wouldn’t want to repeat. Maintaining all the different forum posts, messages was very time consuming. It’s unclear whether it led to more game submissions or donations either. There were relatively few donations. Although there was a lot of interest in the event, converting this into donations proved very difficult. Restrictions on available hardware for demoing games Techshare led to some games not being shown at the conference. This led to annoyance and frustration from some devs. Although AGJam was advertised to the Audiogame and Interactive Fiction communities, I do not believe there was much participation from these communities in the jam. Perhaps as a result of this many games were audio-based adaptations of game styles common in video games. Many submitted games had accessibility failings making them impossible for blind players to play from start to finish. This is almost certainly due to poorly specified jam entry requirements. “Playable by blind people” as a requirement rather than playable through audio would have been better to to press the accessibility aspect more. Sharing links online shortened by Google’s link shortener is fine but these don’t work very well when telling people in person or on radio where to go to find out more. A tinyurl link with a custom suffix or a custom domain that redirects to the GameJolt site would have been much more memorable than a goo.gl link or the GameJolt URL. Thanks again to everyone involved in Audiogame Jam. Please go try the games and if you like them consider supporting Audiogame Jam and the work of the Royal National Institute of Blind People by donating through the Audiogame Jam JustGiving page. 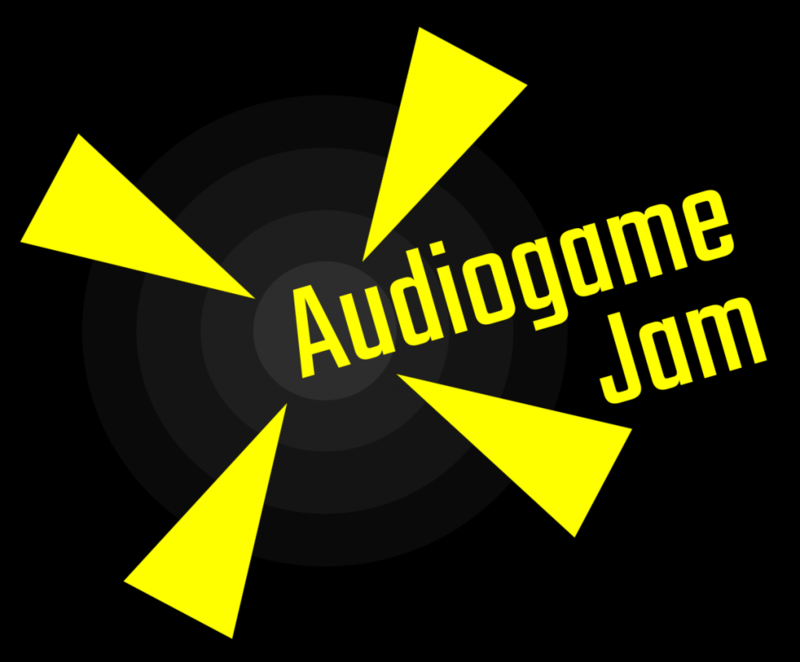 You can find more about Audiogame Jam on Twitter (#AGJam) or contact me @JamesKyle.